Jalandhar: Architectural designs which stand out in worshiping of nature in all of its aspects are the innovative creation of the architecture students of Lovely Professional University. Planned in the context of Andaman and Nicobar islands, their one of the nature-friendly designs has recently been placed a top all other international submissions from across the world. LPU Architecture & Design students Divyansh Gupta, Shreyansh Jain, Hitesh Luthra, and Abhishek Tripathi have emerged as world-winners by presenting incredible ideas of architectural & landscape design and site-planning. 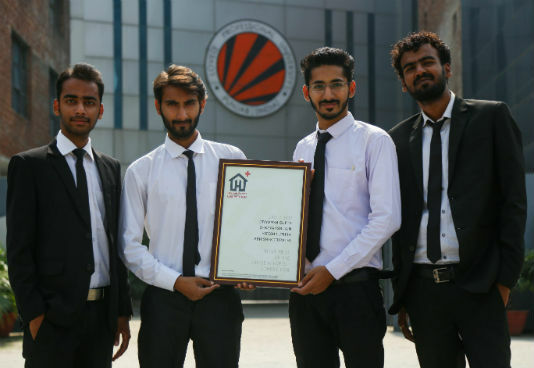 These four promising architects at LPU had competed for the United Kingdom based global design competition- ‘House in Forest 2017’, which was organized by world’s most visited architecture oriented website ‘Arch-Daily’. In this competition, LPU students beat all other competing universities and architectural organizations of China, Russia, Italy, Poland, Vietnam, Romania, Netherlands, Argentina, Norway, Philippines and more. More than 2000 architectural persons had participated in this competition. The aim of the competition was to promote ideas of protecting the forest and its environment. It also encouraged the creation of new living style for houses, pavilions, structures, or landscape. LPU students’ design artistry ‘the Harmonious Niche’ won First Prize of $500 and Winners’ Certificate. Hung Nguyen Architects of Hanoi (Vietnam) won the second prize for their design ‘Mangrove Housing: New Barriers’ and Southwest Jiaotong University (Chengdu) and China, won third prize for designing ‘Heart of Mangrove Forest’.